Since 1996, the backbone of federal support for farmland protection has rested in the Farm and Ranch Lands Protection Program, or FRPP. By bridging federal funds with state, local and private dollars to help these government and private partners protect more than 810,000 acres of rich, agricultural lands. Efforts around the country to protect farmland reflect a deep public commitment to agriculture, to today’s farmers, and to sustaining the land base for future generations of farmers. Supporting these efforts is critical. The USDA Natural Resource Conservation Service reports that, from 1982 to 2007, more than 23 million acres of agricultural land—an area the size of the state of Indiana—was permanently converted to non-agricultural development. 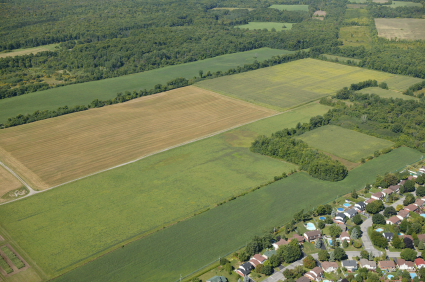 The continued loss of productive farmland to development threatens the viability and future of local agricultural industries, communities and economies across the nation. It is critical that the federal government continue to be an important ally and partner in efforts to reverse these trends. As Congress debates the next farm bill, the Farm and Ranch Lands Protection Program, along with many important conservation programs, will be reviewed and re-assessed. Congress should note that the program has proven to be a cost-effective contributor to locally-driven strategies to protect farmland and support farmers and their communities. Thanks to the local partnership structure, 66 percent of the funding for the Farm and Ranch Lands Protection Program projects has come from non-federal sources, while administrative costs have also not fallen on federal funding sources. Be based on recognizing state and local governments and private land trusts as vital partners and providing matching funds to these partners to purchase agricultural conservation easements. In addition to these key program elements, an effective Farm and Ranch Lands Protection Program—one that will ensure a productive and healthy future for American agriculture—will require adequate funding. The 2012 Farm Bill comes at a time of high-profile congressional battles over the federal budget. In fact, last fall’s attempt to address the deficit through the Joint Select Committee forced approximately $23 billion in farm program cuts over 10 years, with more than $6 billion coming from conservation programs. The Farm and Ranch Lands Protection Program received disproportionate cuts—nearly 30 percent—when other conservation programs saw 10 to 20 percent reductions. All of this, at a time when demand for farmland protection is on the rise, including a steady backlog of existing funding requests and growing interest from the western ranching community. As the 2012 Farm Bill negotiations move forward, Congress needs to have a clear picture of the critical need to protect the nation’s farmland. You can help American Farmland Trust share this message by contacting your member of Congress. Let them know that the Farm and Ranch Lands Protection Program must not see unfair cuts in the farm bill. About the author: One of the nation’s leading experts in Farmland Protection, Bob Wagner celebrated his 25th year at American Farmland Trust in 2010 and has worked in the field of farmland protection since 1981. In his current position, Wagner helps states and local communities nationwide build support for and create policies to protect agricultural land. This entry was posted in farm bill, Farmland Protection, In the News and tagged development, farm bill, Farmland Protection, sprawl on March 23, 2012 by Bob Wagner. Despite the recession, smart growth planning that limits poorly planned development is still important, and voters continue to support public funds for land conservation. While preparing your holiday feasts this season, remember to support your local farmers. Even though farmers markets and CSA farms have finished for the season in some parts of the country, there are other ways to find local produce, such as food hubs. USDA’s Natural Resources Conservation Service is offering programs again this year to help farmers in Ohio improve the health of their land. A variety of USDA conservation programs are available that can help improve soil health and protect wetlands, wildlife, water and farmland. Applications are due Dec. 15, so schedule an appointment to meet with your NRCS representative today. Grab your camera and take your favorite pictures of this holiday season on the farm. The Farm Industry News is holding its holiday photo contest and wants to see how you celebrate and enjoy the holiday season. But you better hurry because the deadline is Monday, December 12th! Small Farm Quarterly, a publication for farmers and farm families across the Northeast, is looking for submissions for their newsletter; farmers and farm advocates are encouraged to contribute and share their stories. This entry was posted in Uncategorized and tagged conservation, development, holiday, local food, NRCS, smart growth on December 10, 2011 by admin.